Well, Charlie is making good progress out there in the workshop, he’s complaining about having 10 thumbs instead of normal hands but in fact there are no mistakes that are not fixable with a little glue and wood, and the number three, four and five frames are now stood up on the building jig, the shape is beginning to become evident and those three frames give a hint of just how much space there will be in this little boat. I have been out looking for more stainless steel screws, and Ullrich Alumnium (branches in most NZ cities) have proven to be very much the best deal going so I bought 3000 various sized screws the other day. A note for NZ builders, I have negotiated my prices on the basis that I will be reselling them, so I can about halve the prices that Placemakers, Bunnings and Mitre 10 charge, and will be somewhat cheaper than the normal rate from Ullrich . If you want some, I can onsell in 100s, Price on application at this stage, shout if you want some. I have 8g x 20mm, 8g x 25mm, 8g x 30mm cs square drive stainless and if this works I’ll get other sizes as well. 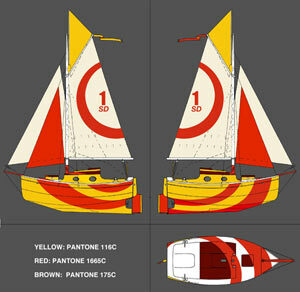 We don’t have much in the way of photos, but Charlie has had an artist friend in Japan do a colour scheme for his boat. He wanted a very high visibility colour, and something that would be unique . My own vision was something more traditional but I must admit that the red and yellow vision with cream decks is growing on me. That will still cope with plywood and thin stock in the meantime.